On New Year`s eve 1912 at 11:15, the first Ritz Carlton in North America opened its doors at 1228 Sherbrooke street West in Montreal. Now, 100 years later, La Grande Dame is reopening after four years of 200 million dollar renovations. In the past century the hotel has attracted many a celebrity, and political figure including Mary Pickford, Edward Prince of Wales, Marlene Dietrich, Charles de Gaulle, and Howard Hughes. It was the scene of the first transcontinental telephone call, as well as the wedding of Elizabeth Taylor and Richard Burton. More recently, Queen Elizabeth II, Brian Mulroney, George Bush Sr, and Celine Dion were guests there. The Ritz Carlton has always been a high class establishement with a strict dress code for dining (even the Rolling Stones were refused entry into the dining room because of their attire! ), and the best of modern comforts. To keep up with the times, the great Edwardian style hotel's expensive renovation kept the historic charm of the initial design and added contemporary amenities like high tech thermostats that record the guest's preferences, and motion activated lights. According to newswire.ca, one of the major improvements is the attention to the environment with small touches, for example, the salt water pool is entirely heated by excess heat from the kitchens! The Flower Pot is celebrating la Grande Dame's return with a stunning mini calla lily bouquet. 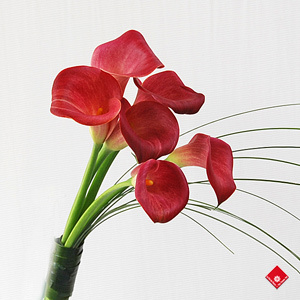 Just like the famous Ritz Carlton Hotel in Montreal, when it comes to classic and elegant, calla lilies fit the bill. This bouquet is made up of distinctive purple mini calla lilies that are so easy to recognize because of their unique shape. The soft curve of the flowers adds romance to a modern arrangement. Calla lilies are in season right now and come in a plethora of different colours like white, yellow, mango, pink, and purple. The Calla's lovely appearance and velvety texture make it the preferred wedding bouquet flower. Let our designers choose our best Calla lilies for your Montreal delivery. If traditional is more your style, The Flower Pot offers a selection of beautiful roses that are, of course, perfect for any occasion.